In the first century, John the Baptist predicted that He would come. When He did, the world was not the same. Fueling the church as if it were a wildfire, He became the driving force behind its exponential growth. Since the days of Pentecost, the Holy Spirit has been the power behind every move of God in every generation. Who is this extraordinary Helper? World-renowned speaker and author Marilyn Hickey answers that question and much more in...He Will Give You Another Helper. Informative and exhaustive, this comprehensive book will guide you into a deeper, Spirit-filled walk with God. It is the definitive source for answers concerning the Holy Spirit and God's people. In the course of examining this vital aspect of Christian living, you'll discover: The presence of the Holy Spirit throughout the Old Testament, The working of God's Spirit in the early Church, The movement of the Holy Spirit in the 21st century, The dynamic and personal nature of God's Spirit, Practical in delivery, Marilyn Hickey illustrates the role of the Holy Spirit in daily life. Filled with examples of the Holy Spirit's involvement with people through centuries, He Will Give You Another Helper is both captivating and inspiring. It is the essential manual on Spirit-filled living and the influence of the Church in society. Discover a new life in the Spirit. Learn about and experience the power of the Holy Spirit! Be refreshed. 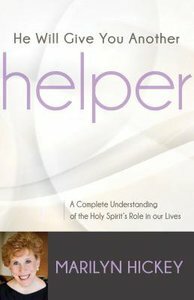 Learn to walk with the Helper today! Book jacket. About "He Will Give You Another Helper"